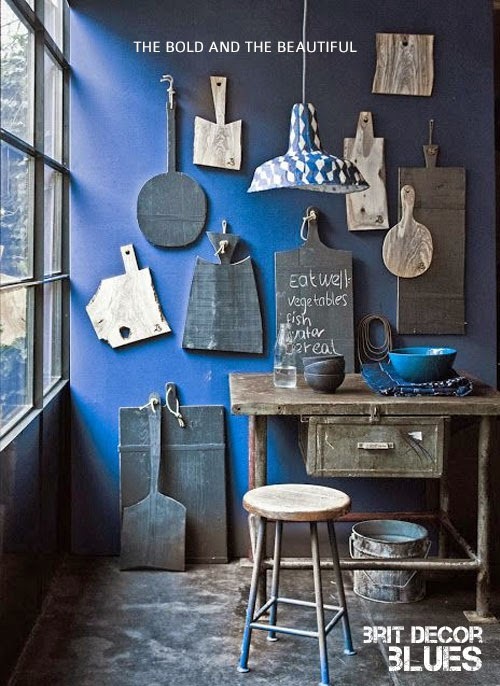 Blues are a regular friend of Brit Decor so it's a real thrill to know that this colour palette is featuring big on the design front in 2014, with a particular emphasis towards navy blues (navy and white are my perfect Summer combo for interiors and fashion wear too). So is navy the new black? Quite possibly! 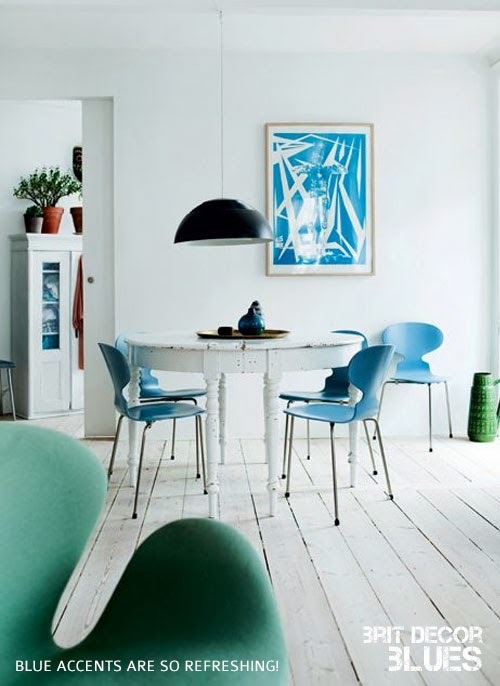 Turquoise offers a great intro to that Spring feeling with a fresh and uplifting look. 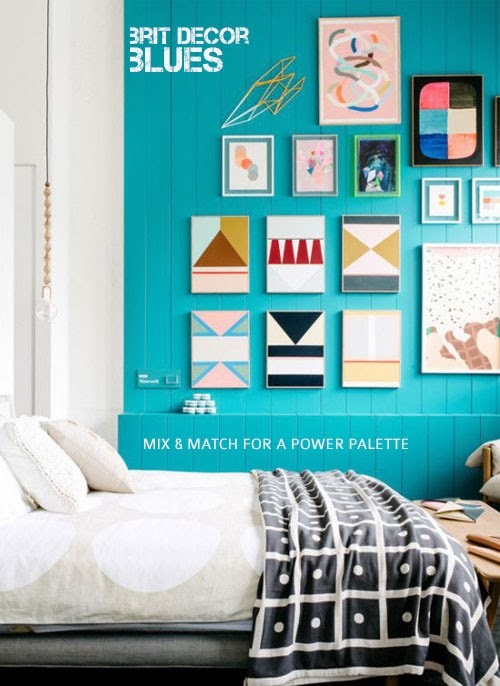 I love a strong and concentrated shot of this shade as a colour-block feature wall. Wherever possible, work your blues in conjunction with some white detailing for the ultimate crisp contrast. My hunt for today's 'shop the look' accessories, below, was huge fun and a welcome dose of retail therapy. IKEA's Ljusas Uvas table lamp (no.1) is a must-have with its show-stopping vivid blue glass base and corresponding shade. I am a huge fan of notebooks and love to have one on hand to jot and doodle, particularly following my recent decision to abandon my iPhone notes in order to appreciate the more traditional approach. This Anchor's Ahoy duo from trendy stationer, Paperchase, really floats my boat (sorry, I couldn't resist the pun!). 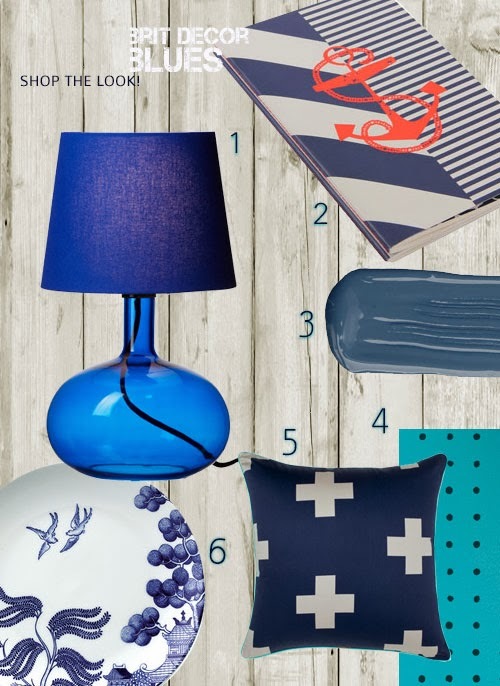 No's 3 & 4 are both from Mini Moderns, but I could have selected so much more from this loveable British brand! 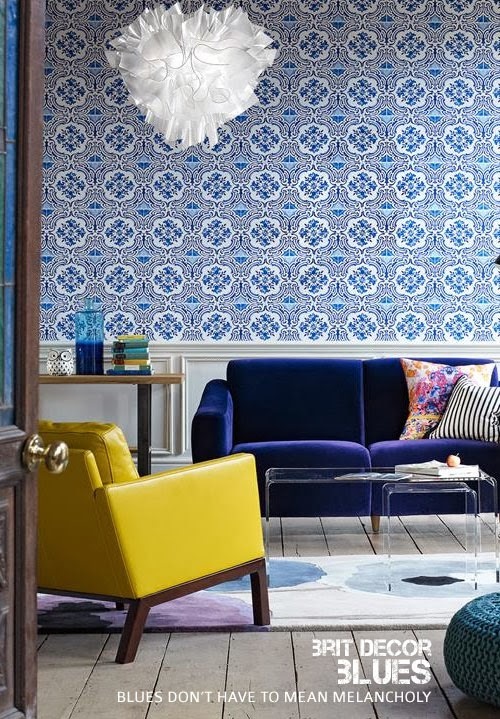 Their Washed Denim emulsion offers a darker and more sophisticated look, whilst the Peggy wallpaper in Lido blue is fun and fresh. Australian store, Aura, provides us with look no.5 with their Crosses pillow case - I absolutely love the turquoise piping detail! Finally, I was really taken with Amara's Willow Love Story salad plate (no.6), which not only combines the striking contrast of blue and white but it is also based upon the classic willow pattern design. We love an update of a classic, don't we? So will you be styling in blue this year?